National Beer Day is April 7 in the United States. Not to be confused with National Drink Beer Day, which is in September, or American Craft Beer Week, coming in May. National Beer Day commemorates the Cullen-Harrison Act of 1933, which made low-alcohol beer and wine available for the first time since it was outlawed in 1919. It was the first step toward the full repeal of Prohibition later the same year. We’ve found some beer deals in craft beer-loving cities around the U.S. to help you celebrate. Many local bars and restaurants are getting in on the celebration, so ask about specials at your nearby brewery or watering hole. It should go without saying, but just in case: These events are for adults 21 and older, so have your I.D. handy. Join the New England Real Ale Expo in Boston April 6 to 9 at the South Boston Lithuanian Club. Enjoy a selection of more than 100 rarely seen, award-winning cask ales, ciders and meads. Admission is just $5 at the door for most sessions. This little city of 42,000 is home to one brewery for every 3,800 people, according to Thrillist. Small but mighty, its craft beer street cred draws on the history of New England. Stop by Vermont Pub on Thursday. It’s the state’s longest-running craft brewery — be sure to try its experimental beer of the week, a Maple IPA. Shops and restaurants throughout Grand Central Terminal in New York are celebrating with specials — including discounted beers. 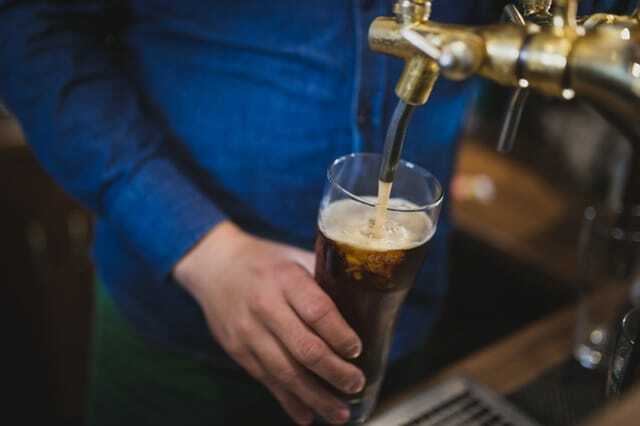 Enjoy beer-related deals from Beer Table, Central Market New York, Grand Central Oyster Bar & Restaurant, Michael Jordan’s The Steak House, Shake Shack, Shiro of Japan, Tri Tip Grill and Zaro’s Bakery. Free Beer Class and tap night at Tyler’s Restaurant & Taproom. Thirsty Monk Beer Dinner is a six-course meal with six paired beers for $55. It’s not a cheap night out, but it’s good value for the price! Celebrate in Portland at the annual Brew Hog Blowout at North 45 Pub, featuring 21 brewers for a “mini beer fest,” house smoked ribs and door prizes. Elsewhere in Oregon, you can grab $7 growler fills at Three Creeks in Sisters, and $6 growler fills at Seven Brides in Silverton (every Thursday). On April 7, Two Brothers Tap House and Brewery is unveiling the Pollinator, a house-brewed honey wheat beer. Sample the new brew for free, and enjoy complimentary beer-centric appetizers, according to the Scottsdale Independent. Southerleigh at the Pearl Brewery will be serving its four-beer flight for just $5 — normally $12-$16. Plus, its eight-beer flight will be $8 — normally $20-$30! Southerleigh’s executive chef and brewmaster will also host the James Beard Dinner at the James Beard House, showcasing local favorites and a selection of Southerleigh beers, according to San Antonio Magazine. Growler USA is hosting an all-day, all-night happy hour, according to Austin Monthly. Specials include 10% off growler refills, $2 off appetizers, $3 off kombucha, $2 off wines and $2 off all Texas beers. Each guest will also receive a free 64-ounce plastic growler to take home. Celebrate in Brew City on Thursday with Miller Time Live at Miller Time Pub and Grill. Enjoy $2.50 Miller Lite taps and free music from Brent Brown. If you don’t want to go out for thirsty Thursday, celebrate National Beer Day at home! Ibotta is offering a $3 rebate on Budweiser, as well as between $2-$4 back on combinations of Bud and your favorite party snacks. Not a Budweiser fan? Get $4 back when you buy Shock Top with oranges or lemons. Your Turn: How will you celebrate National Beer Day 2016? Disclosure: This one time, Kyle came into the office with $6 worth of Taco Bell that he planned to eat over the course of three meals. By clicking the affiliate links in this post, you help us help Kyle seriously ease up on the Taco Bell.